Paperback, 8.5 x 11.75 in. / 40 pgs / 22 color. 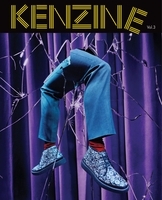 The third installment in French clothing line Kenzo's collaboration with Maurizio Cattelan and Pierpaolo Ferrari's Toilet Paper takes its readers on a journey to an unfamiliar world—a place where, as Kenzo's Creative Directors Carol Lim and Humberto Leon write, "the ordinary is slightly distorted, mirrors lead to other dimensions and the strange and beautiful coexist in singular harmony. We love that David Lynch's (the inspiration for our collections) skewed and somewhat disruptive sense of storytelling seamlessly fits with how the Toilet Paper approach image making and the final results speak for themselves. Needless to say we're delighted with the outcome and hope everyone else enjoys the images as much as we do." 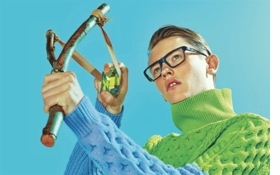 Numbered edition of 2,000 copies. 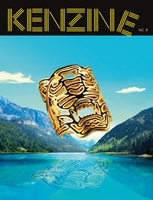 Featured image is reproduced from Kenzine. FORMAT: Pbk, 8.5 x 11.75 in. / 40 pgs / 22 color.